Take free shipping over total control with an advanced calculation tool. Provide free shipping based on cart subtotal after a discount to make delivery cost processing maximally precise. The module provides free shipping based on a cart value after a discount. Default Magento functionality doesn't take into account prices after a discount. Enable the extension just in one click. 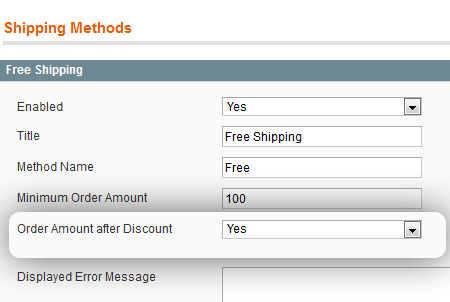 Native Magento functionality doesn't take into account discounted prices when offering a 'Free Shipping' method to customers. Thus, when a cart value decreases after a promo code application, free shipping will be still available even when the grand total doesn't meet the method conditions anymore. With the Free Shipping After Discount extension you'll be able to accurately calculate shipping costs and display only relevant shipping methods on the shopping cart page. The module automatically disables free shipping if after a discount the cart value gets lower than the minimum order amount allowed for this method. Don't know how to provide a 'Free Shipping' method based on cart subtotal after a discount? Simply enable the 'Free Shipping After Discount' option in your Magento admin panel and a free delivery will be provided based on a discounted cart subtotal. For example, you offer free shipping for orders equal or greater than $100. A customer adds to cart products with the total value higher than $100, but after a coupon application the grand total reduces to $85. In this case the module won't offer the 'Free Shipping' method as the final cart value is lower than $100. Need more shipping tools? With the Shipping Rules extension you'll be able to easily modify shipping rates by popular shipping carriers like UPS, DHL, FedEx and many others. In case you want to restrict shipping based on cart subtotal (including the subtotal after a discount) take a look at the Shipping Restrictions module. Was able to install this within minutes on a live site without any issues. Used to be able to do this through Shopping Cart Price Rules. However, upgraded & now Shopping Cart Price Rules no longer work for this. Didn't even realize that it wasn't working until an order came through with deep discounts & free shipping. So, I desperately needed a fix to keep that from continuing. This extension was the fix needed. Works beautifully & with Magento v.1.9.3.7.